Click here for a listing of where we’re at so far. The next was be Sat. Nov. 10 and feature: Werebear, It’ll Grow Back and BRawCity. Thirdly was The Sunburns, Sci-Fi Caper, and I Don’t Exist. featuring a multitude of the bands who have contributed a track. *What do I have to submit? for us to deal with on the mastering end, so this is the format we are asking for from you. to use the song. Something as simple as forwarding an email from the songwriter you are covering would suffice. * What is the due date? When do I have to have my stuff submitted? We’re looking at the end of MARCH 21 as a deadline, so that we can have the project out and available by late Spring in order to pre-promote for the 6th annual FUSE Festival. * Who gets accepted for the project? the trouble to make this project come to fruition. * Does this project cost the bands anything? There is no charge to be part of the project. We will pay for the mastering and pressing of the CD version and for hosting the online version.You will have to pay for getting your song recorded. This cost can vary of course. Some folks have access to people or equipment that can makeit happen, while others will have to enter a recording studio. We *have* found a great partner and friend in Robbie Olsen (who runs Rolsen Recordings in Kingsburg). * Where will the money go from sales of the album? Creative Fresno to be used towards supporting the FUSE Festival. So you see, it all goes back to supporting local music. 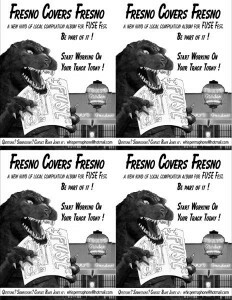 *Do I have to cover a currently existing Fresno-area band? Any artist past or present , any band currently together or not, is fair game. *What local artists have committed so far? and what bands are they covering?